Push notifications for mobile and web that boost customer engagement & retention. Our data study of 63 million new app users shows that when brands send high value push notifications more frequently (sometimes more than one a day!) users are more likely to engage and keep their app. 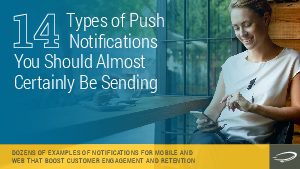 So what kinds of push notifications should you be sending? Download this eBook for 50+ examples you can use to increase the frequency of your notifications (web or app) — and reap the bottom line benefits.